Stems: Erect to spreading, often solitary, short-branched above, glabrous. Leaves: Alternate, simple, sessile, clasping, oblong to ovate, .5 to 2.75 inches long, .25 to .75 inch wide, dotted with minute resinous glands; margins toothed to occasionally entire; tips blunt to pointed; upper leaves reduced. Inflorescences: Heads, several to numerous, terminal, 1 to 1.5 inches wide; bracts overlapping, sticky; tips turning outward. Flowers: Ray florets 12-37, about 1/2 inch long, yellow; disk florets numerous, dark yellow. Fruits: Achenes, small, ribbed, tipped with 2-8 fine-toothed awns, enclosing small seed. Habitat: Dry, disturbed sites, waste areas, and roadsides. Distribution: Throughout, more frequently in north 1/2 of Kansas. 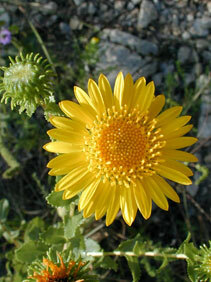 Forage Value: Livestock find curly-cup gumweed unpalatable due to the tannins, oils, and resins it contains. Uses: Many Great Plains tribes used this plant medicinally to treat coughs, colds, stomachaches, liver disorders, snow-blindness, and as a wash for saddle sores. Comments: The common name comes from the resinous sap and curling bracts of the flowering heads. The roots can grow to 6 feet long, giving plants good drought resistance.